I read this article and found it very interesting, thought it might be something for you. 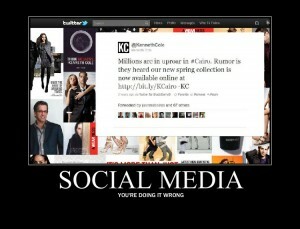 The article is called Kenneth Cole’s Egypt Tweet Sets the Social Media Sphere Alight and is located at https://www.ben-johnston.co.uk/kenneth-cole%e2%80%99s-egypt-tweet-sets-the-social-media-sphere-alight/. There’s an old saying, dating back through generations in the business world: any publicity is good publicity, but in today’s social media-savvy world, does that really hold? I was going to write about this on Friday as the events were unfolding but some other elements came to light and I decided to hold off and see how everything unravelled. More on that in a bit. Here’s how it was: Friday morning, fashion designers Kenneth Cole posted a Tweet on their official account which read “Millions are uproar in #Cairo. Rumor is they heard our new spring collection is now available online”. As I’m sure you can imagine, the social media sphere, the internet marketing world and the PR community went berserk. Social media can be tricky to get right sometimes and although it can seem that using current trending topics to get your name out there is a good idea, Tweets like this can backfire in a tremendous fashion. Social media basics, kids: if you’re piggybacking off of discussion about a country tearing itself apart to sell some more shoes, chances are you’re doing it wrong. Now there are obviously people that will argue that this is a benefit to the company – this has spread the word about their brand quicker than most other campaigns would, but the backlash simply has to have harmed their brand reputation. The Twitter storm that erupted and ensuing blog posts from platforms far more reputable than this one would have seen to that. A couple of hours later, Kenneth Cole himself apparently removed the Tweet, posted an apology on Facebook and shared it via Twitter. As things progressed, photos started showing up on Flickr and Twitter showing that the Tweet might not have been a spur of the moment thing or a mistake of an intern, but rather part of an orchestrated campaign – the Tweet was chromed onto a Kenneth Cole shop window. When I saw it, I was convinced that either A) someone had been being a little clever with Photoshop (the most likely scenario as I saw it) or B) the company were REALLY doing it wrong. I decided not to write about this until I got all the information, and it turned out that these photos were real but the decals had been put up by some pranksters. How long they stayed up or, indeed, how someone managed to slap them on there smoothly and then take a photo without anyone noticing is anyone’s guess. Only in America, I suppose. There’s a reason that so many marketing agencies find social media to be such a hard sell to their clients, no matter how beneficial it can be to their cause and that reason is things like this. It’s not the first time that a company has tried to leverage trending topics – even negative ones – to their brand’s advantage, and it won’t be the last, but that’s not to say that it shouldn’t happen. There is good publicity and there is bad publicity. Anytime you’re being blogged about purely because someone with access to the company Twitter account tried to use an event where people are losing their lives to spread the word about some clothes, that’s bad publicity. I might be writing the Kenneth Cole name on this blog right now – something I would probably never do normally – but anytime the keywords Meta tag features the word “Fail”, that’s not a good thing. This is not to say that social media can’t be used properly by companies – there are some fantastic examples of it. Mashable recently covered the way the WWE uses it to promote their scripted conflicts between shiny giants and I discussed the way Toyota have leveraged it for their new Prius campaign a couple of weeks ago. This is exactly the way social media should be used for a business. The bottom line is that marketing predominantly exists to get people buying your stuff. If people are talking about you, they know you’re there, and then you might have a better chance of getting them to buy your stuff. If people are talking about you in the kind of connotation that means you have to apologise and play the backtracking game, they might know your name but the likelihood is that they won’t buy your stuff. That’s bad marketing and bad publicity. Congratulations, Kenneth Cole. You’ve probably made my job just a little bit harder until the next company fails at the intarwebs. For this, I will probably not buy your stuff (not that I could afford it anyway, but you know what I mean). What do you think? Is any publicity still good publicity or are things just moving too fast these days for that to be the case? Leave me a comment and let me know.